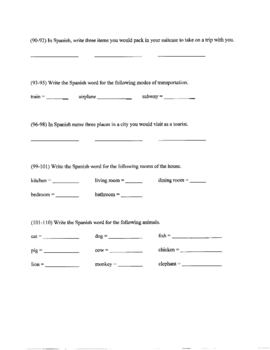 Use this 5-page packet, consisting of 110 questions to quiz your in-coming Spanish 2 students and check their memory from Spanish 1. They love doing this beginning-of-the-year activity and it gets their minds back in the swing of thinking in Spanish. They may or may not have had exposure to all of the material presented in the packet, and that is OK! It's just a way to get the kids re-engaged and ready to dive into a new year of studying the foreign language!